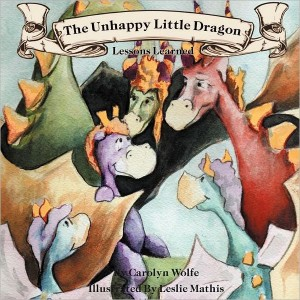 Joining us today is Carolyn Wolfe, author of The Unhappy Little Dragon, Lessons Learned. This is a children’s book geared toward ages 6 yrs old and up. Thank you for joining us today, Carolyn. Can you please start off by telling us a bit about yourself? I would be happy to. I am a free lance writer, poet and author of six books, which include my poetry, short stories and stories written for children. I also write articles for our local monthly newspaper, The Old Town Compass, here in Winchester. One thing I enjoy very much about being a writer for children, is that I get invited to speak at local kid’s festivals, as a story teller. At these events I get to play dressup in a costume and show off my super colorful, dragon hand puppet. It is at these times when being a writer is most rewarding because you get to see the kids actually enjoying listening to your book. As a kid, I always loved playing pretend and making up stories. I guess I still do. I have always enjoyed writing poetry and decided to write bedtime stories in verse for my little nieces’s and my nephew when they were very young. I love fantasy stories and a few years ago decided to try my hand at writng a narrative story for children, that would be fanciful and also meaningful to them. Yes, I think that it is more of a challenge to keep the children’s attention. 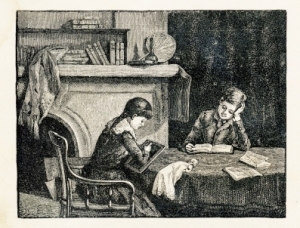 I believe the subject of the story also needs to have some meaning to their life as well, so that they can connect to the story. The smiles on their faces as they react to the book! I love having a wide canvas to paint the story on, that literaly anythinhg goes- as long as it makes sense in the context of the story. This is my latest book, and it is all about a little Dragon who is eight seasons old, who cannot control his fire. He breathes fire at the most unhelpful times. This story is about how he comes to learn more about his ability and how special he is, after having an adventure in the woods. I was daydreaming out the window of my office one day and seemed to see a dragon’s face in the leaves of a big tree across the parking lot. The leaves shifted and it seemed the dragon smiled. I started writing the story right then. They can purchase a copy online through www.amazon.com, and through Barnes and Noble online. The book is available in print and also as an e-book. The e-book version can be purchased at www.dieselebooks.com and www.lybrary.com. Yes, for more information my website can be visited at : www.whenthemoonspeaks.com. 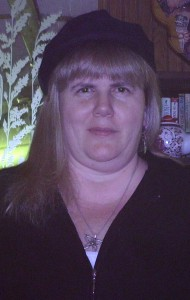 I also have a facebook page titled Carolyn Wolfe’s Poetry and Prose. I have written another children’s story, all in verse titled: My Knight At The Faire, which I hope to have out by this December 2012. I am also working on another collection of poetry for a general audience and a book of my original and very spooky, short stories that will be for a young adult readership. I just wanted to thank you so much for this interview, and for letting me get the word out about my new book! Thank you for spending time with us today, Carolyn. We wish you much success. This is the tale of a little Dragon who has a big problem; he cannot control his fire! After a major mishap, he runs away into the forest and has a wonderful adventure where he meets new friends, learns that every creature has a unique gift. He also finds out the special way in which he can use his own remarkable gift of fire. His forest friends help him understand that he really is a very special dragon indeed! Shelley asked, looking at Happy expectantly. “Tell myself? What do you mean?” asked Happy not understanding what his new friend was getting at. Shelley answered, “Well, maybe I should ask instead, how do you feel when you practice holding in your flame? “Oh that! I feel scared, so scared that I will fail and burn everything up!” Happy answered sadly. “Well now, I have a suggestion for you. Try feeling like you will not burn everything up. Instead tell yourself you will succeed in keeping your fire to yourself!” Shelley told him. Happy argued in a worried little voice. Then Shelley continued to explain. “Dragons aren’t the only ones who have special gifts, Happy, no, no! All of the animals were given a special gift of one kind or another. All of us had to learn how to use it wisely, just like you. You sort of have to grow into your gift, like growing up! That’s why the animals need a teacher. Can you guess what my special gift is?” Shelley asked, expectantly. Happy didn’t know the answer so he shook his head and just kept quiet. “Why Happy, I am a teacher!” Shelley said proudly. 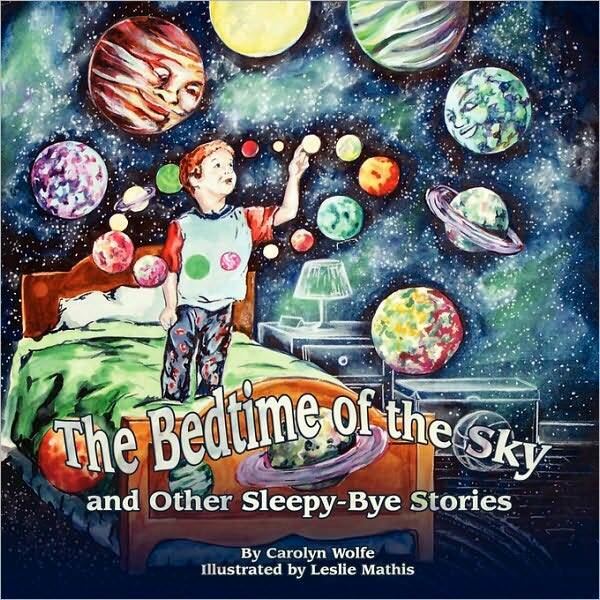 Carolyn Wolfe is a freelance writer, poet, and author of six books including her collection of poetry, short stories and bedtime stories for children. In this, her sixth book, “The Unhappy Little Dragon, Lessons Learned” she reveals the journey of Happy, The Unhappy Little Dragon, who, while trying to understand how to master his uncontrollable gift of fire, has an exciting adventure in the woods. His forest friends help him understand his gift and that he really is a very special dragon indeed! Ms. Wolfe lives in the Shenandoah Valley with her Photographer, husband Scott, and her houseful of animal companions. You can visit her website at When the Moon Speaks. Look for our interview with Carolyn, coming soon!